RenewableUK has announced that the UK has hit a historic milestone of 20 gigawatts (20,000 megawatts) of wind generation capacity. The opening of Ørsted’s 659MW Walney Extension off the coast of Cumbria this month pushed the total amount over the 20GW mark. Total operational capacity of onshore and offshore wind generation in the UK currently stands at 20,128MW, which is enough to meet the annual power needs of more than 14 million homes, cutting carbon emissions by 25 million tonnes a year. Wind is the UK’s largest source of renewable electricity, accounting for half of the 30% of power that came from renewables in 2017. The UK’s first commercial onshore wind farm, Delabole in Cornwall, went operational in 1991, and the first offshore wind project in Blyth began generating in 2000. 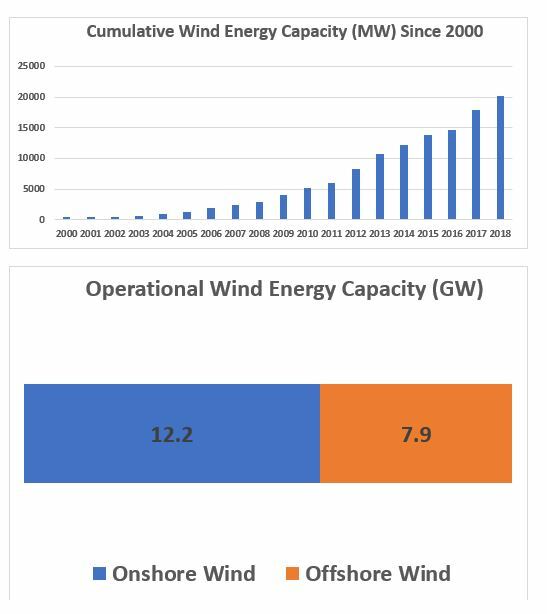 Initially, wind deployment climbed slowly to 1GW in 2005 and grew to 5GW in 2010, before expanding rapidly to 10GW in 2013 and 15GW in early 2017. A further 5GW, a quarter of total wind energy capacity, came on line in the last 21 months, to push the UK above the 20GW mark this month. This new milestone coincides with the 40th anniversary of the founding of the wind industry trade body RenewableUK, which originally founded as the British Wind Energy Association by a group of engineers and academics meeting at the Rutherford Laboratory in Oxfordshire in November 1978. “It took 19 years to install the first 5GW of wind energy in the UK and we’ve now installed the same amount in under two years. That phenomenal growth shows just how quickly the UK is moving to a smart, low carbon power system and wind energy is at the heart of that. “Over half of the UK’s wind generation capacity is onshore, which is the cheapest option for new power. However, Government policy preventing onshore wind from competing for new power contracts means that consumers will miss out on low-cost power that will keep bills down. RenewableUK’s members are building the future energy system, powered by clean electricity. It brings them together to deliver that future faster; a future which is better for industry, billpayers, and the environment. It supports over 400 member companies to ensure increasing amounts of renewable electricity are deployed across the UK and access markets to export all over the world. Its members are business leaders, technology innovators, and expert thinkers from right across industry. It is celebrating its 40th anniversary this year. New renewable energy capacity is secured by Government through competitive auctions for power contracts (Contracts for Difference) which were established in 2013. Since 2015, onshore wind has been excluded from Contracts for Difference auctions.